After yesterday's quick mention of the proposed EJSM / Laplace mission to Ganymede and Europa, I had a read through the 128-page pdf and there's a lot of information there that should be summarized in a still informative but much smaller format - an executive summary, if you will. This mission has still not been given the go-ahead as it is competing with two others: a 20-metre telescope that would be able to see the edge of black holes, and a trio of satellites that would be able to see ripples in space-time left by the moment of creation itself. BBC's article on the three is the best one to read for an introduction to all three, including radio interviews with some of the scientists involved. While the other two would be nice to have, I definitely prefer the EJSM / Laplace mission to Jupiter and its two most interesting moons, as understanding the gas giant planets and moons in our own backyard is critical as a model to more accurately understand extrasolar gas giants that we are now discovering in the hundreds per year, and the simple fact that Europa and Ganymede are close by, Callisto could be inhabited by humans, and life could be present there. A summary of the mission would be the best way to show what an exciting prospect it is, and if you want a more comprehensive view then feel free to read the pdf yourself. EJSM - Laplace would be a joint NASA-ESA mission involving two probes launched in 2020, which would then arrive at the Jupiter system in 2026 after a Venus-Earth-Earth gravity assist, the same route and time as Galileo. 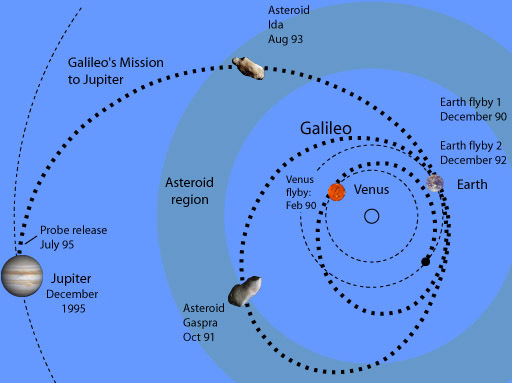 Galileo's route can be seen here, and the immediate question upon viewing it is whether these two probes would be able to fly by any asteroids on the way, but no mention of asteroids is made in the pdf. NASA's probe would go to Europa and be powered by nuclear energy, Europe's probe would go to Ganymede and be powered by solar energy, meaning not as many instruments could be turned on at the same time. The first radio interview in the BBC article has more on that. Laplace would also spend a lot of time near Callisto (about a year) before finally orbiting Ganymede. The primary goal of the mission would be understanding the emergence of habitable worlds around gas giants. 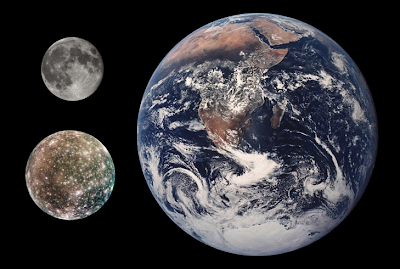 Both Ganymede and Europa have oceans underneath their surfaces, but the best observations we have of them have been gleaned from Galileo flybys, which by their very nature only give random sections of the moons, making long-term observation of interesting portions impossible. 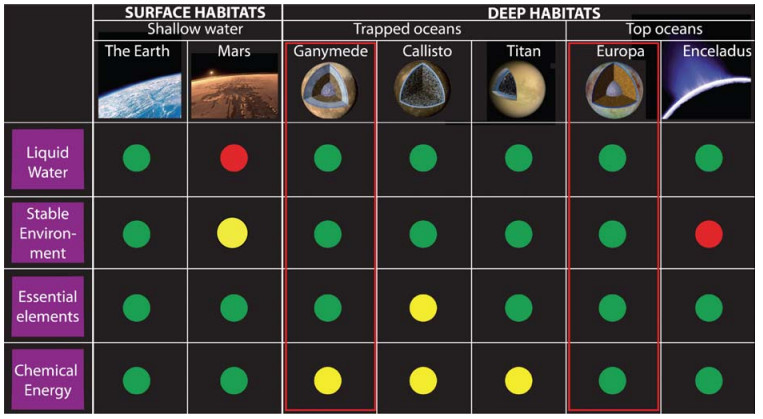 In addition to the possibility of life there, a greater understanding of the nature of gas giant planets themselves will aid us in knowing more about gas giants in other solar systems, many of which are located in the habitability zones of their stars, and thus any moons orbiting them would also be candidates for life (think Pandora in Avatar). and only the fact that it is located next to both the largest moon in the Solar System (Ganymede) and one of the most likely destinations for life (Europa) keeps it from receiving more attention. After a tour of the Jovian system and entering orbit around their respective targets, the probes would orbit them for 9 months, move closer and closer over time and eventually impact the surface. No Huygens-style landers will be possible due to the (near) lack of an atmosphere. After launch and a six-year trajectory using a Venus-Earth-Earth gravity assist, both probes will arrive at the Jupiter system. While approaching it they will begin long-term monitoring of the atmosphere and magnetospheric processes. The two spacecraft will arrive in a staggered fashion. After arrival and before entering orbit around Ganymede and Europa the spacecraft will each begin with a multi-year tour of Jupiter's system, with flybys of all four Galilean moons. 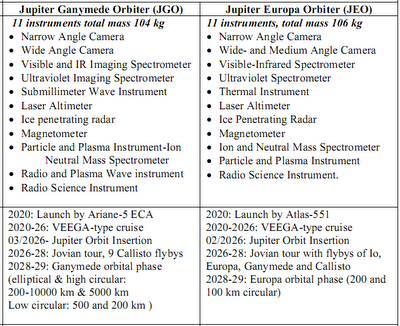 The JEO (Europa) orbiter will perform flybys of Io and a few of Callisto, while the JGO (Ganymede) orbiter will conduct a detailed study of Callisto - in other words, JEO will focus on the inner two and JGO the outer two. After this 200 km orbit there are two options: one is to probe lower altitudes during orbital decay, and the other is to remain at 200 km for an extended mission. At this altitude eclipses will limit electricity that can be gathered, but will not significantly affect the mission. What will limit spacecraft lifetime though will be radiation. 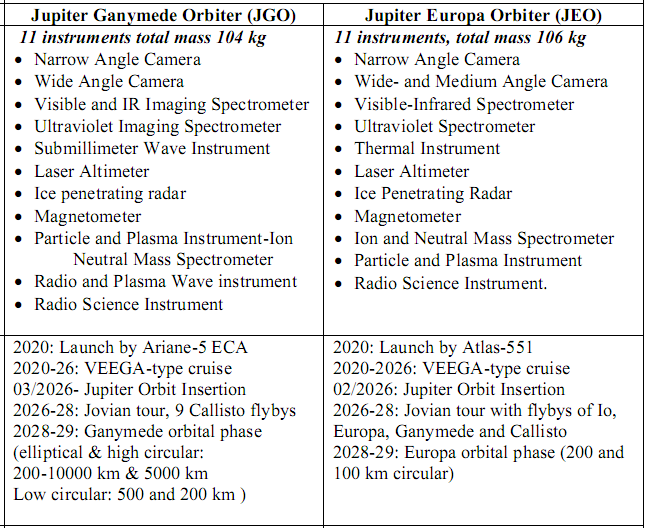 NASA's Europa orbiter (JEO) is in blue, ESA's Ganymede orbiter (JGO) is in red. Io will only be flown by with the Europa orbiter near the beginning, Callisto will get more attention from the European orbiter but a few flybys with the other orbiter as well, and though both Europa and Ganymede will receive flybys now and then, the main part of the mission will actually take place near the end when all other goals have been achieved, which makes sense as there is no way to get back out of a close orbit without using a lot of fuel. Ocean - characterize extent, and relation to the deeper interior. Ice - characterize the ice shell. For Europa, also characterize subsurface water, and surface-ice-ocean exchange. Composition - determine global composition, distribution and evolution of surface materials, with special focus on habitability for Europa. Geology - understand formation of surface features, find sites of past and present activity, with special focus on future in situ exploration for Europa. Local environment - characterize local environment, interaction with Jupiter's magnetosphere. Jupiter's atmosphere - dynamics of the weather layer, auroral structure, moist convection, etc. Jupiter's magnetosphere - particle acceleration process, interaction between Jupiter's magnetosphere and the Galilean moons (plus other smaller moons), etc. Io's active dynamic processes - investigate tidal dissipation, active volcanism, interior, dynamical rotation state, etc. 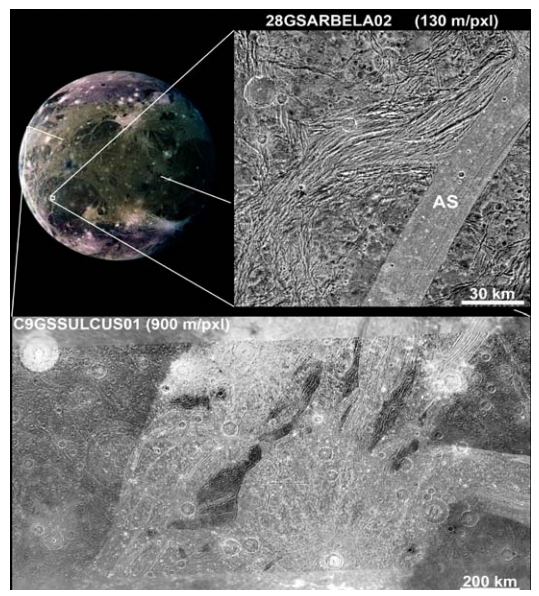 Callisto as witness of the early jovian system - investigate interior, icy shell, tidally varying potential and shape, ionosphere and exosphere, surface organics and inorganic chemistry (outgassing, etc. ), global and regional surface ages, etc. Rings and small satellites - conduct comprehensive survey of the entire ring-moon system, identify processes defining origin and dynamics of ring dust and small moons, etc. Here yellow means likely but not demonstrated, red means not possible, red is demonstrated or very likely. 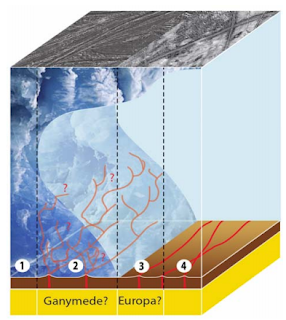 What makes Europa's ocean particularly interesting is that it is in contact with the rock layer below, while the oceans on Ganymede and Callisto are more likely to be frozen both on top and at the very bottom, giving little to no interaction with the rock layer below. More interaction with the sea floor results in a greater chance of life being present, because differentiation of the rock would likely allow salts and other essential elements to be present. This exchange could be possible on Ganymede and Callisto as well, but not quite as straightforward. Materials from below likely rise to the surface through fractures and cryomagnetism, making it possible to observe them from afar, which is why an orbital mission could be sufficient in making a judgment on whether life is likely to exist below. As of today there are 515 confirmed extrasolar planets, some 1200 (!) probable exoplanets detected by Kepler waiting to be confirmed, and many more on the way. Techniques to discover extrasolar planets improve by the day, and even tiny Qatar discovered one last year. The next mission to Jupiter, Juno, will arrive in 2016 and further our understanding of Jupiter and thus other gas giants in general, but it will not have the focus on planetary moons and their habitability that EJSM / Laplace will have. Juno will be in a near-polar orbit (being solar-powered is one reason for this as eclipses are best avoided) with closest approach to Jupiter just 5000 km over the cloud tops, and will not focus on the low-altitude regions of the system where regular satellites are located, nor the Galilean moons. By the time EJSM / Laplace arrives at Jupiter (2026) we will already have a large catalogue of extrasolar moons orbiting gas giant planets that we will know a little about through direct direct analysis, but will need to know more about in general terms through a greater understanding of the gas giants and their moons in our own solar system. At the time of the mission we will have a good statistical knowledge about gas giants, and thus every improvement in our knowledge of our own will resonate among each and every one we have discovered elsewhere. 1) In-depth comparative study on the two pairs of Galilean moons. Io and Europa are primarily silicate/metal bodies, while Europa and Callisto are primarily icy. 2) Studying Jupiter itself and its giant, rotating magnetosphere. 3) Studying coupling processes inside the system: gravitational coupling between Jupiter and its moons, and electrodynamic interactions coupling Jupiter and its moons to its atmosphere, magnetosphere and magnetodisc. 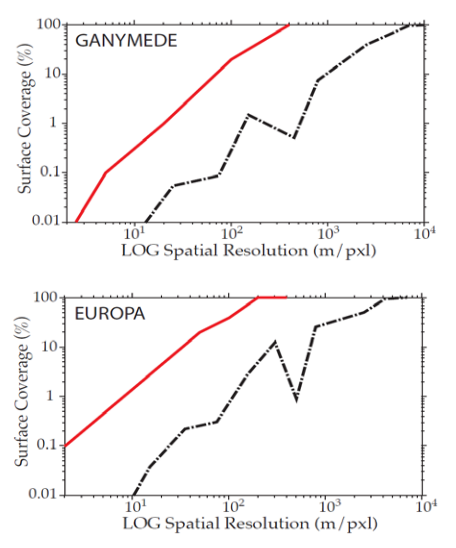 These graphs showing current (Galileo) surface coverage of the two moons compared to expected surface coverage are quite interesting. Galileo coverage is represented in black, and upcoming EJSM / Laplace coverage in red. Alternate launch dates: if March 2020 cannot be done, May 2022 is the second-best date. Launching in 2022, however, would require a larger launch mass (more propellant) and the trip to Jupiter would take 7.1 years instead of 5.9 years. And with that concludes the summary. The mission truly could not be better for one conducted by two probes: in addition to orbiting the two most interesting moons, Ganymede and Europa, it is great to see that Callisto will be given a great deal of coverage, as a base to settle the jovian system is best constructed on a moon where radiation is low, and surface gravity is high enough to (hopefully) avoid muscle entropy over the long term. Whether Callisto's surface gravity (12.6% that of Earth) is enough is impossible to say at the moment; in fact, without any practical experience in anything besides Earth gravity and zero-g we don't even know if Mars (37.6% that of Earth) has enough. But we can safely assume that some is better than none at all.